Staff pleasant, entertainment lacking, service for the bar slow due to the allocation of 1 bar 1 no staff at all times evenings or days. 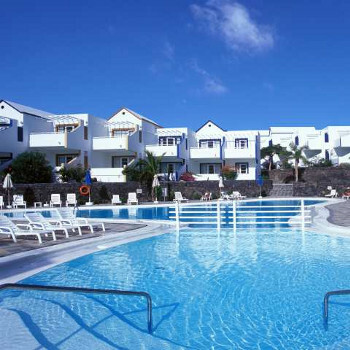 Hotel tip: You would find better and nearer Puerto Del carmen for the money. We booked this last minute for my husbands 50th birthday, we were all inclusive, but I would not recommend this! Food was terrible, lukewarm if you were lucky, not a great deal of choice. The hotel is in a good location, 5/10 mins walk brings you to the centre with a few bars, a good choice of restaurants, prices were reasonable. Rooms were spacious and clean, though we had to change rooms as there were ants in our beds! Hotel staff are very friendly though they could do with a few more of them, one barman serving and running back to the restaurant to clear plates etc, also pool bar closes at 6, then you have no outdoor seating area to sit with drinks, have a cigarette etc, so we took some tables outside but staff didn't like us doing that, and once 11'oclock comes you get charged for drinks so staff expect you to go home then! All in all I probably would not go back to this hotel, but the resort was nice, and will definitely be going back to Lanzarote. We stayed All Inclusive which was my first time. I wasn't very happy with the food, there was alot on offer but nothing that looked particularly appealing. Dinner for me consisted of chips and a yoghurt which says a lot. We ended up getting fed up with breakfast also and going down to an Irish pub in Matagorda for a much more satisfying fry up. I cant complain with the cleanliness of the aparts, they were cleaned regularly and the pools , bar area etc were all clean. The location was good. It was just a short walk down to the resort centre of Matagorda and a 5-10 mins taxi journey to much more livlier Puerto Del Carmen. The staff were very moody at the pool bar it was like a hassle when you went to get more drinks. Also the bar downstairs was hardly ever manned. The entertainment was pretty much bingo every night which was thoroughly boring although the entertainers tried to be as lively as possible. There is a pool table,table tennis, tennis court and also a football court with hockey style goals. We never got charged for our table tennis bats or balls or tennis rackets up until half way through our holiday. I think they realised they could make a bit extra money out of us as we were using them constantly,it left a bit of a bad taste. Overall Ii would definitely visit this hotel again and recommend it to others. Though I would advise to taking some extra money incase like me you dont like any of the food. Can't really say too much about the entertainment as we didn't stay around for it. It was well advertised and a good variety. Hotel was clean - maid service six days a week. Two excellent pools and a snack bar on site. The hotel is located only a short walk from the small commercial area of Matagorda and the beach so there is lots more choice depending on what you fancy. You can get a great breakfast for about 3.50 euros or for a meal try the 7/9 euro menu at Oreos which is on the front in Matagorda.